Pretty envelope received from Smash. 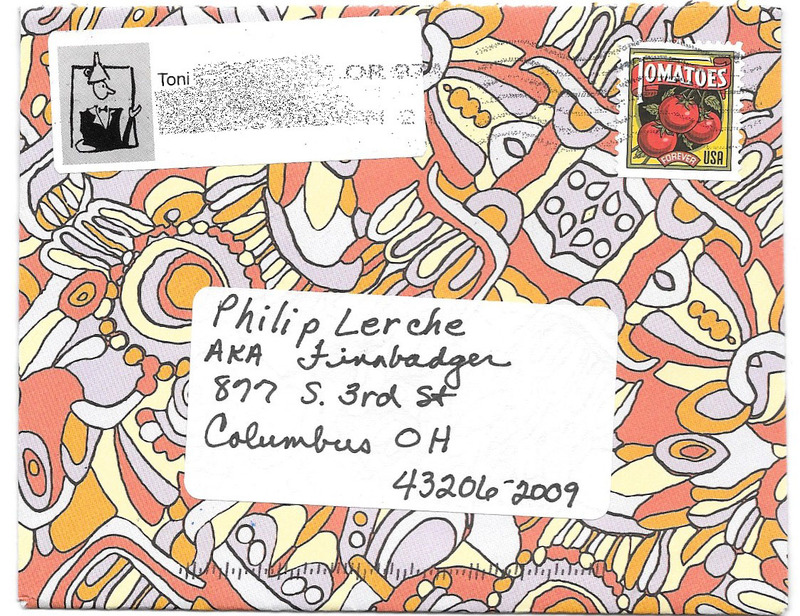 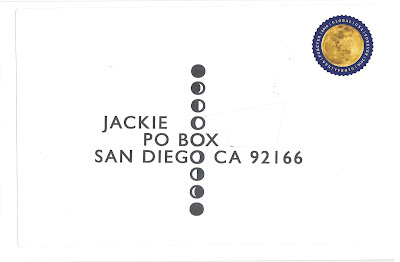 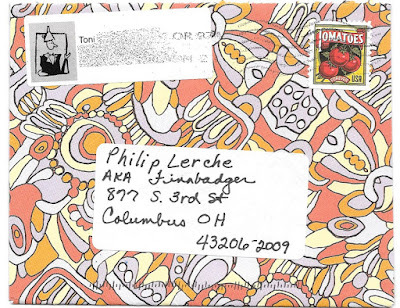 This is the other side of the double-sided, double-stamped envelope Jean sent. 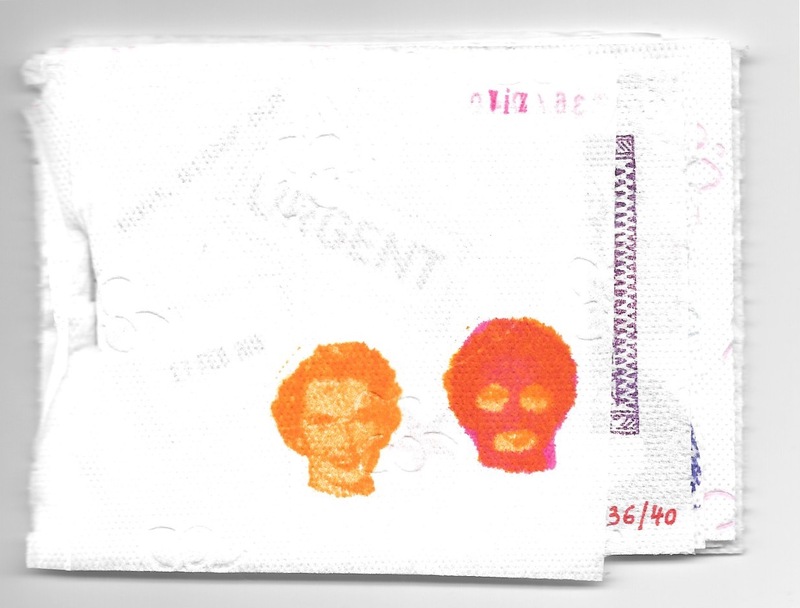 Two of the love stamps made it through unmarked. Clever use of the same colors from the stamps. 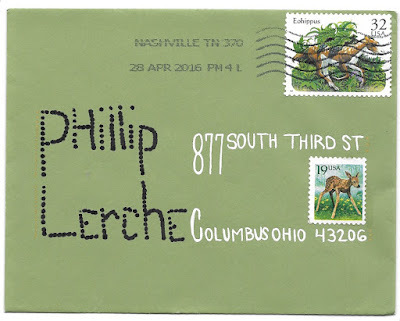 Dots from Amy, with a fantastic stamp featuring the extinct Eohippus. 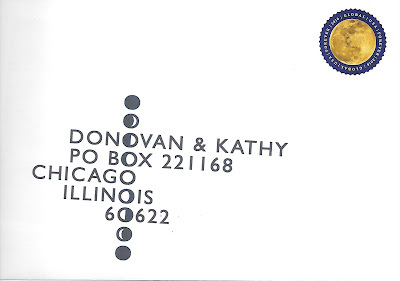 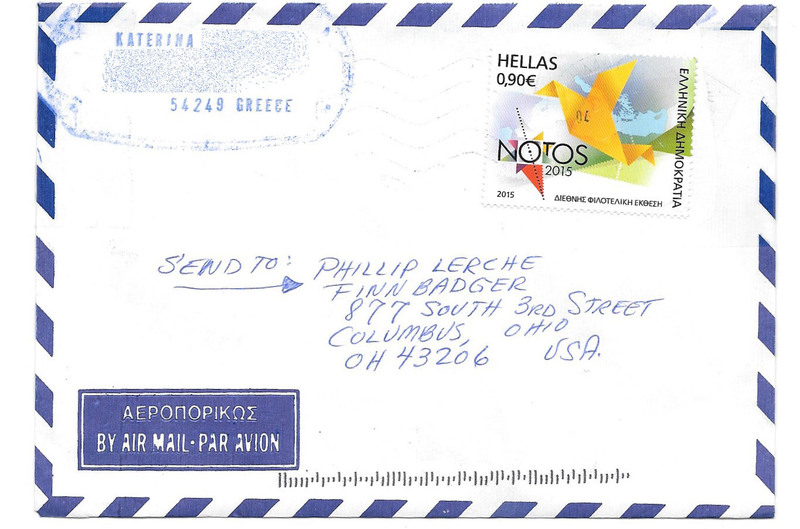 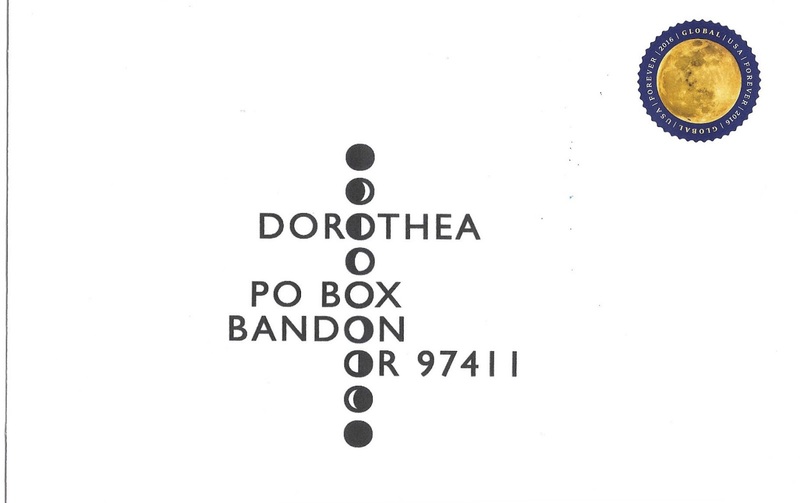 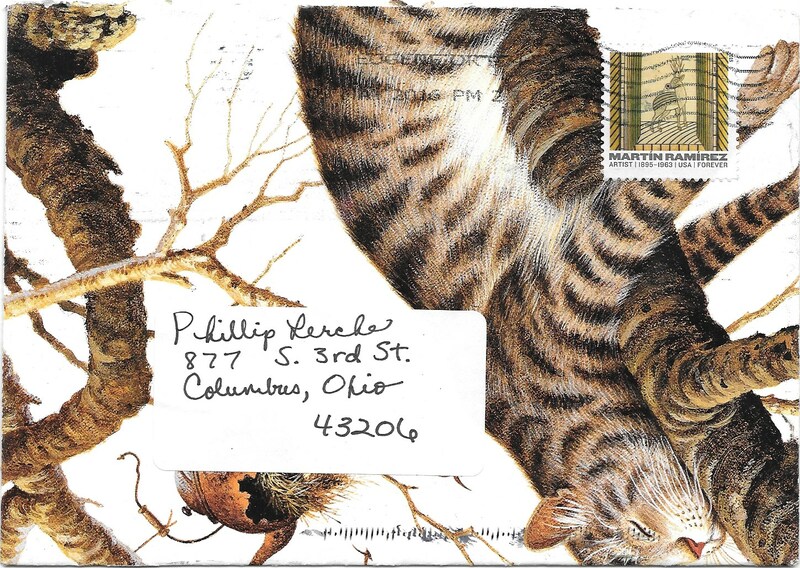 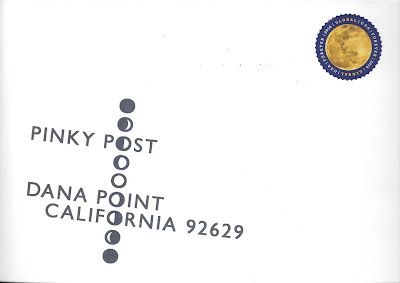 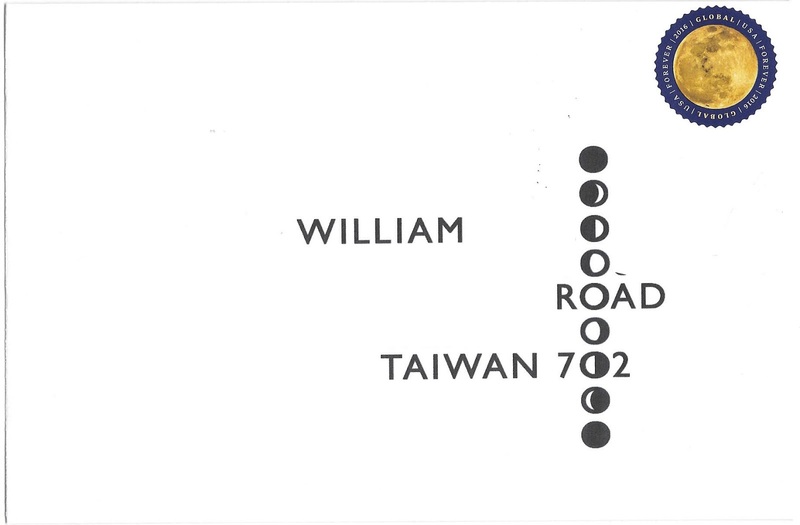 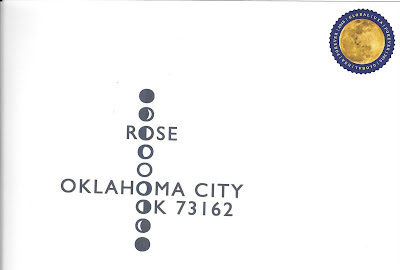 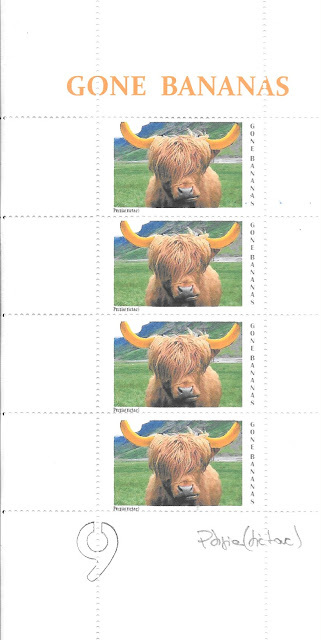 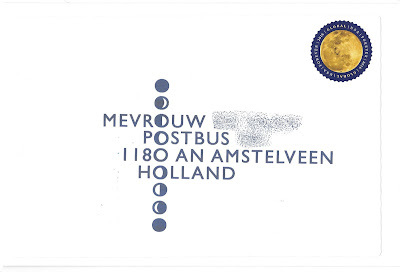 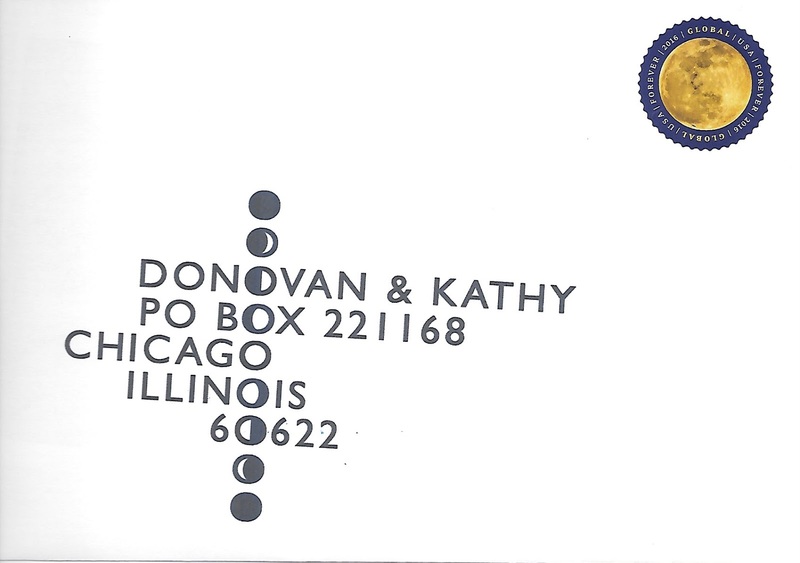 Another pictorial postmark this week. 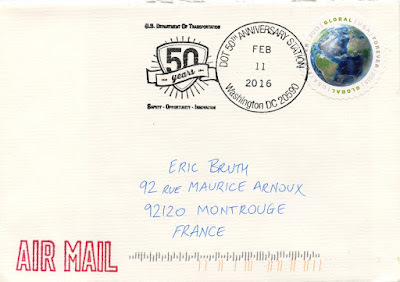 Eric and the US Department of Transport turn 50 together this year. 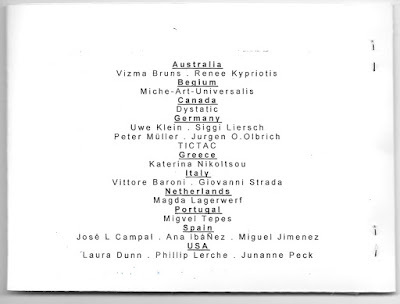 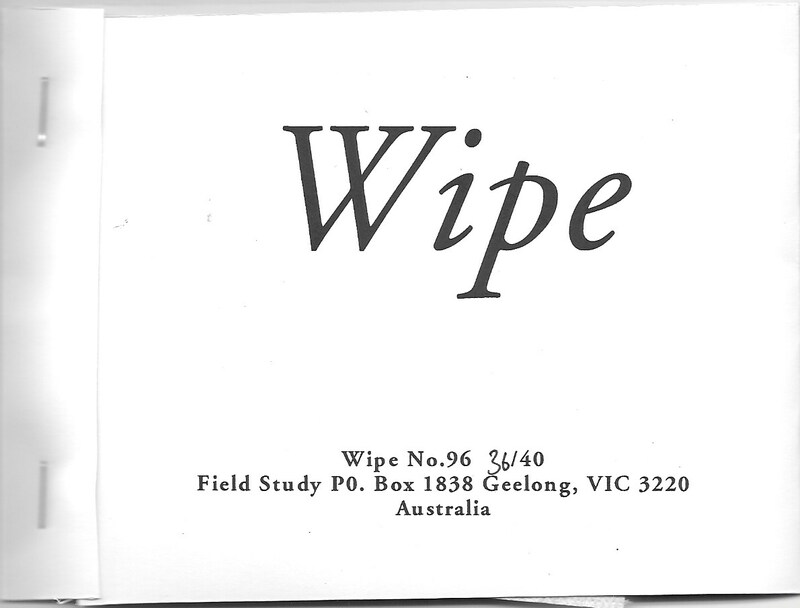 Wipe is a cooperative publication from Field Study International. 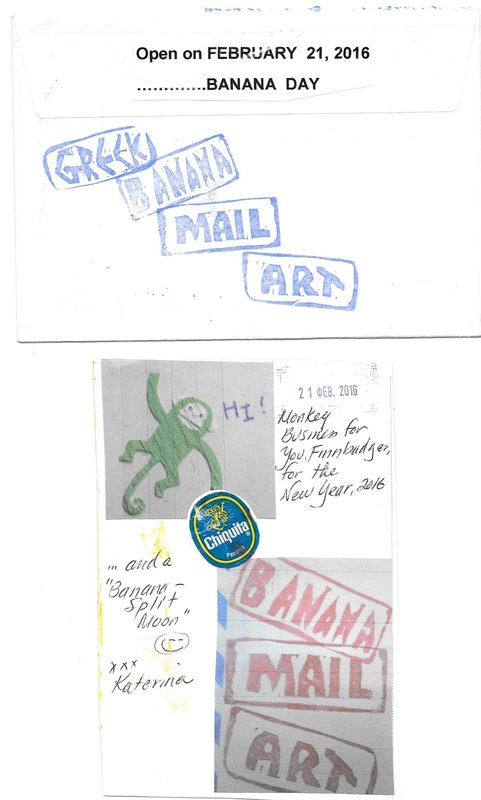 To keep costs down, and perhaps to create the ultimate in recyclable/disposable art, entrants submit 40 pieces of toilet paper with art on them for each issue. Twenty are reserved to send to each of the artists, the rest are sold or given to museums. I was fascinated by this concept after I noticed Momkat had blogged about it, so participated for the first time. 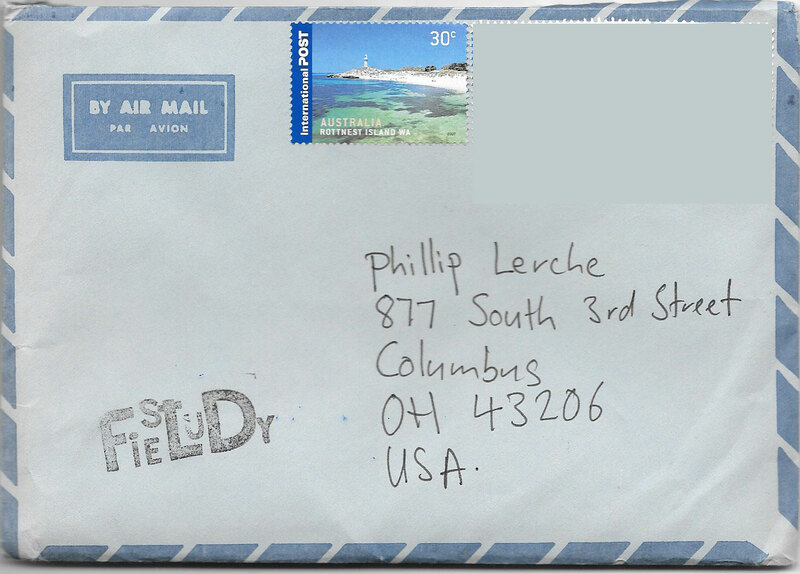 A rather thick, vintage-looking airmail envelope arrived on a 'big mail Friday' along with several other pieces. 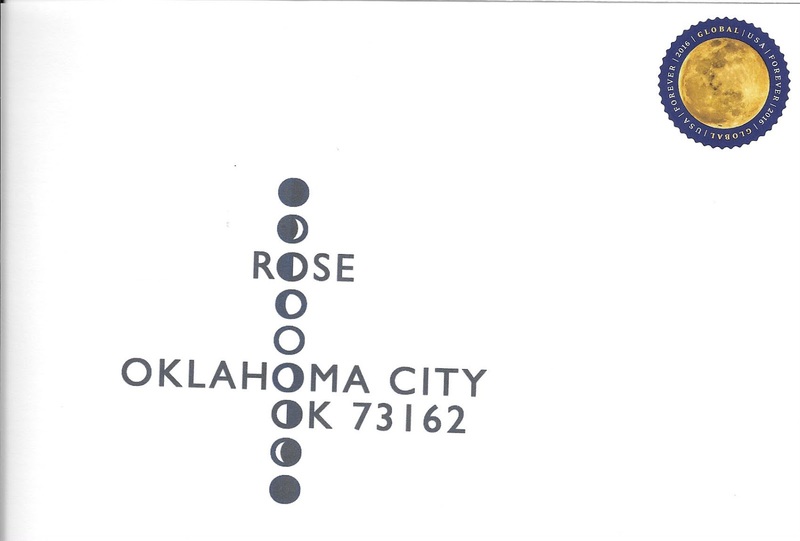 This lighthouse stamp is an entry for Sunday Stamps - for links to more lighthouses go here. It is part of a set titled 'Island Jewels'. 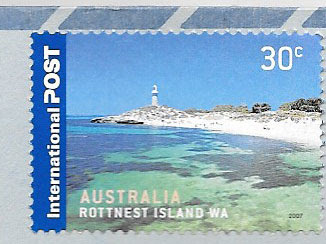 I think this is Bathurst Lighthouse (the other one on the island is Wadjemup lighthouse which opened in 1896, the first stone lighthouse in Australia). It opened in 1900. 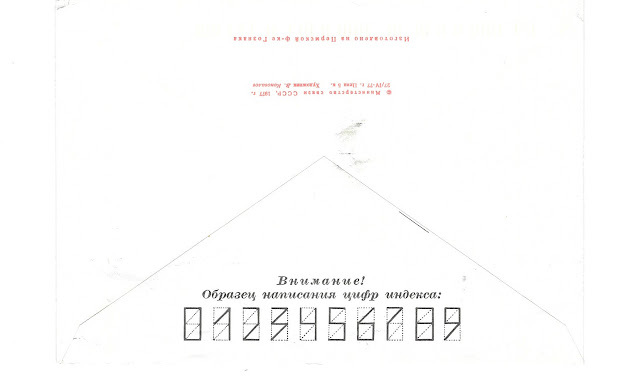 Some selected pages. 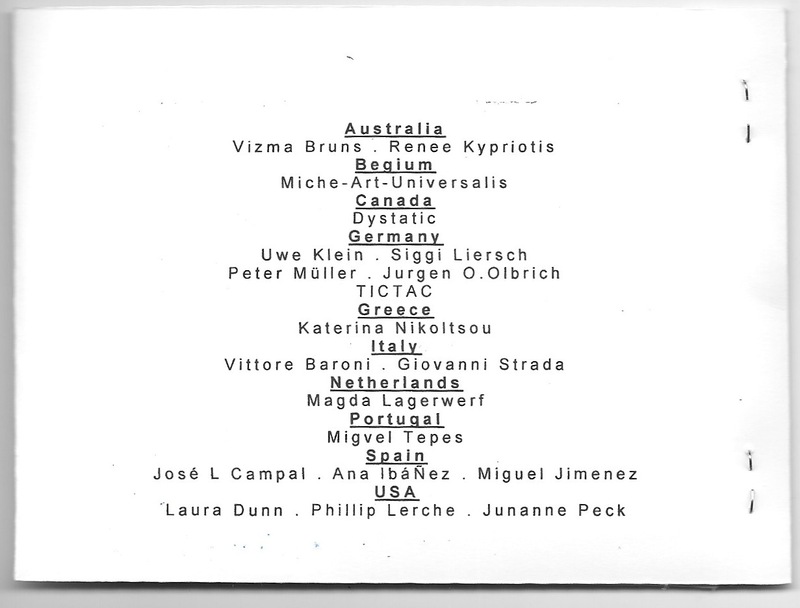 First up, Vizma. This is the envelope I sent it all off in in the first place. 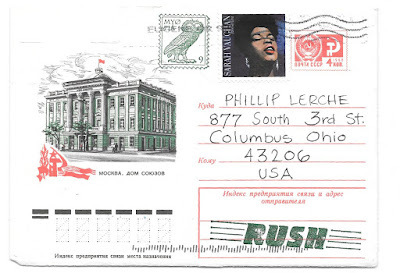 Dorothea sent me an altered postcard and an ATC, enclosed in its own tiny handmade envelope, inside this fantastic Russian envelope. 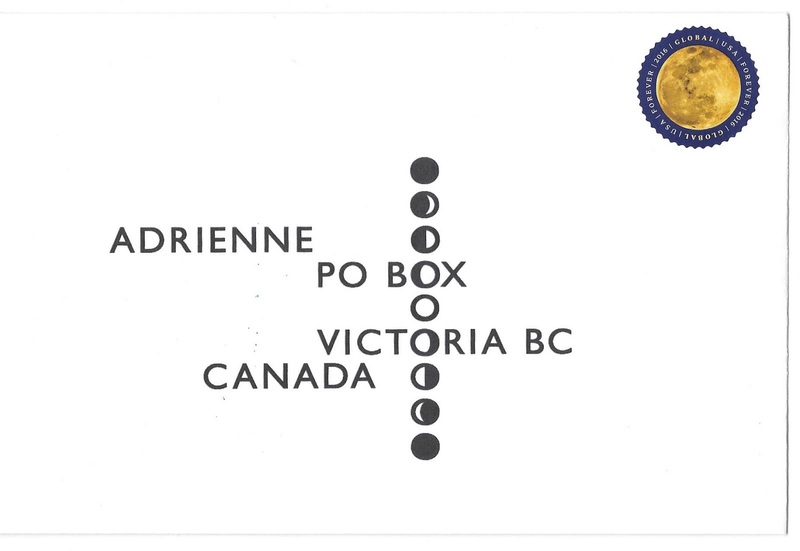 I love the back flap, which shows you how to use the boxes to write the postal code numbers. 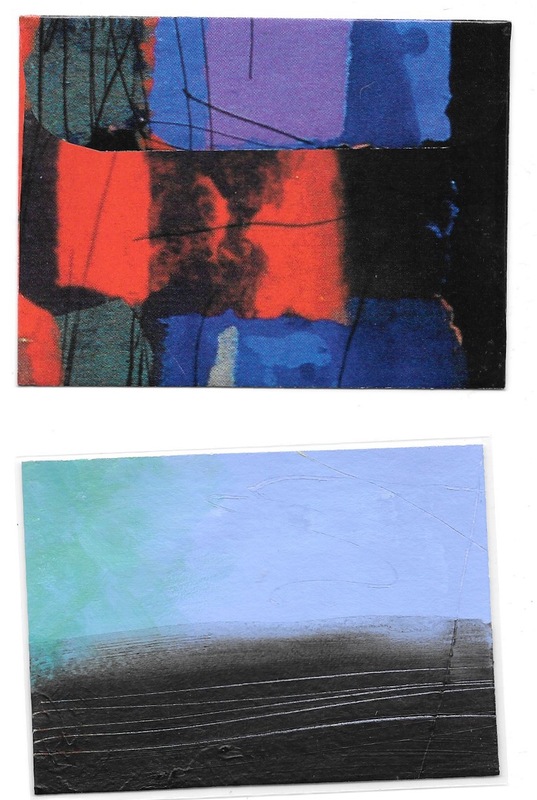 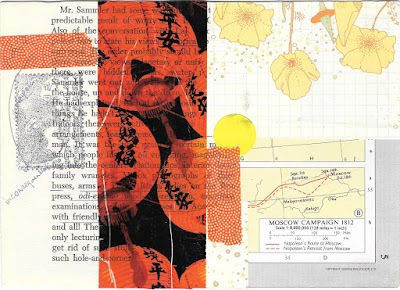 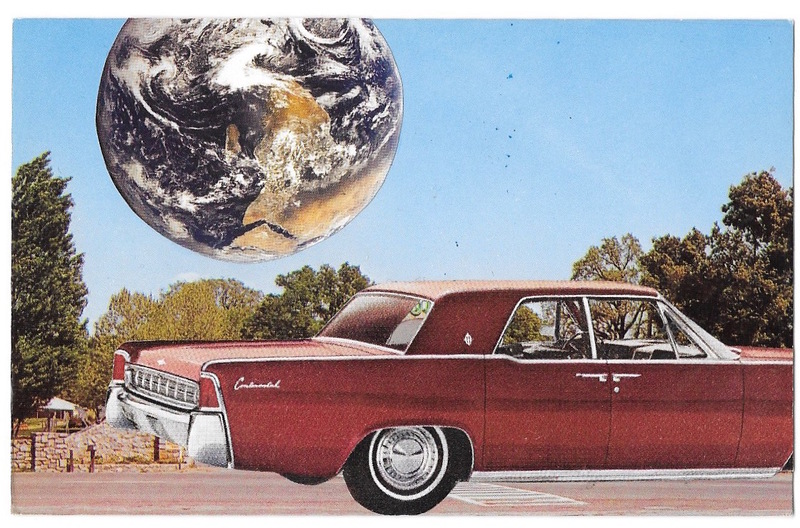 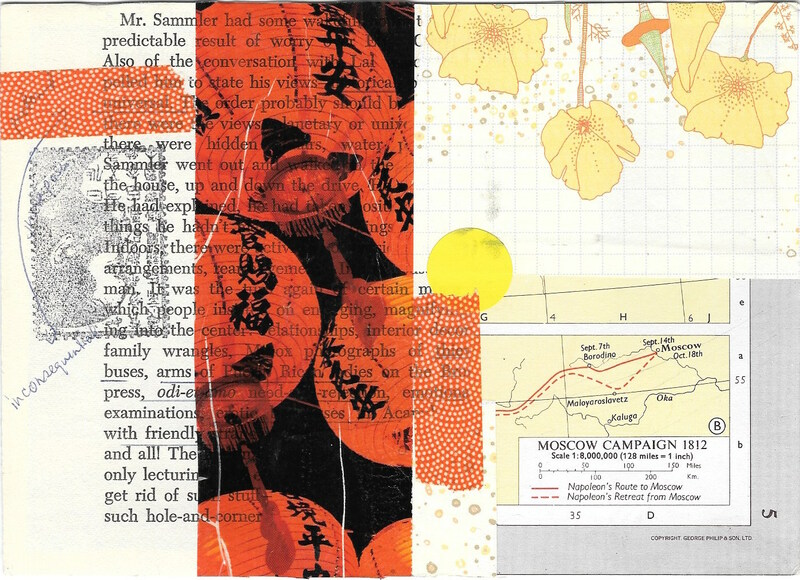 Toni sent me this intriguing double-sided collage. 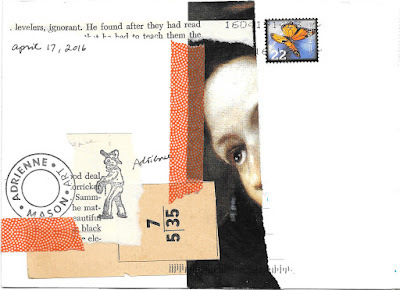 The collage arrived in this homemade envelope, complete with a stamp from one of my favorite commemorative issues of 2015. Erni sent me a new glue pic. 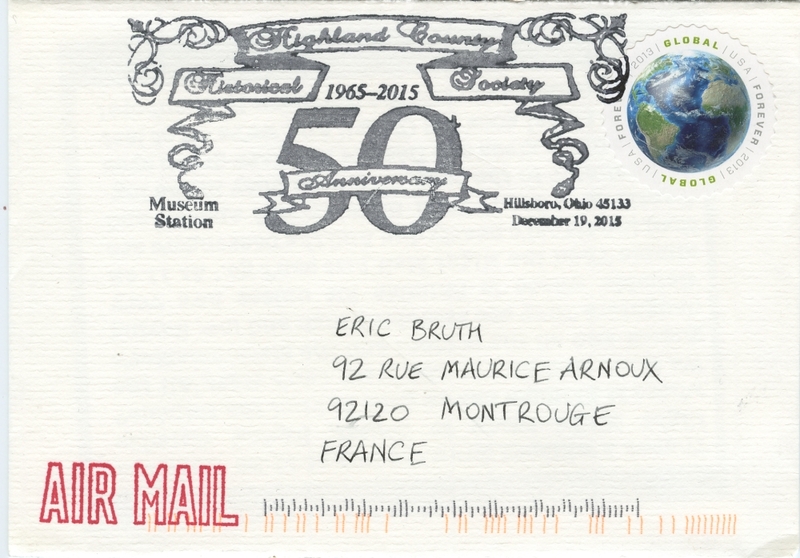 Homemade envelope and postcard from Eric. 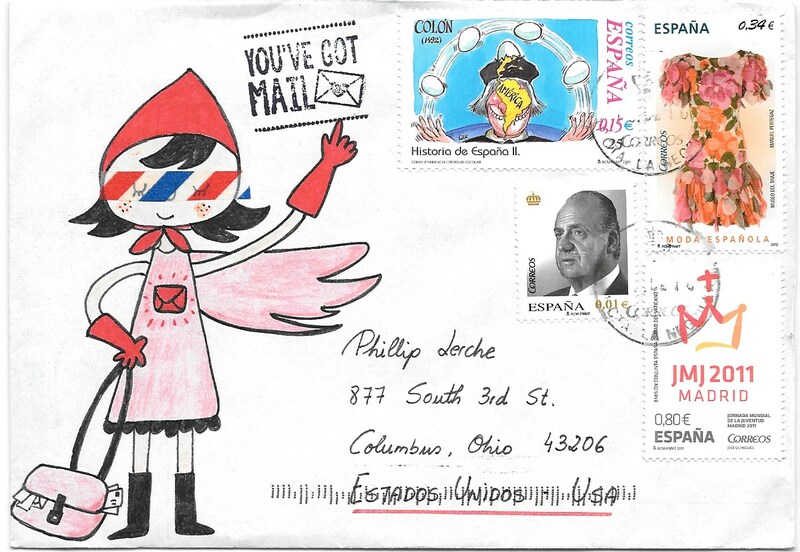 The airmail washi tape over her eyes reflects a recent discussion Eva and I had about anonymity in mail art. 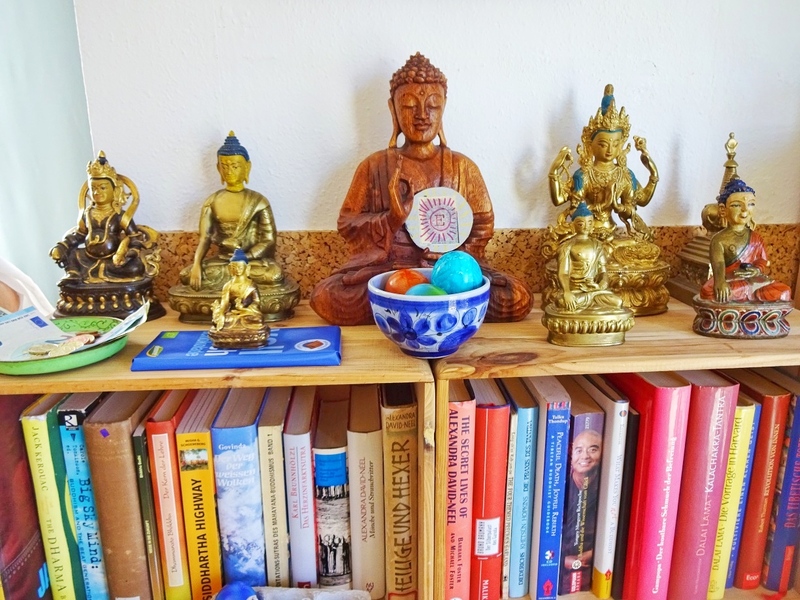 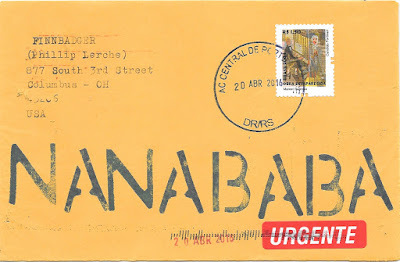 And Eva posted this one from Ceuta, in a Spanish enclave on the coast of Africa, so it has some really interesting stamps - the man juggling the eggs is Columbus... on his way to Columbus by mail. I was looking for various ways to contribute to Eric's 50 theme, and noticed that some organizations celebrate their 50th anniversary with special pictorial postmarks. 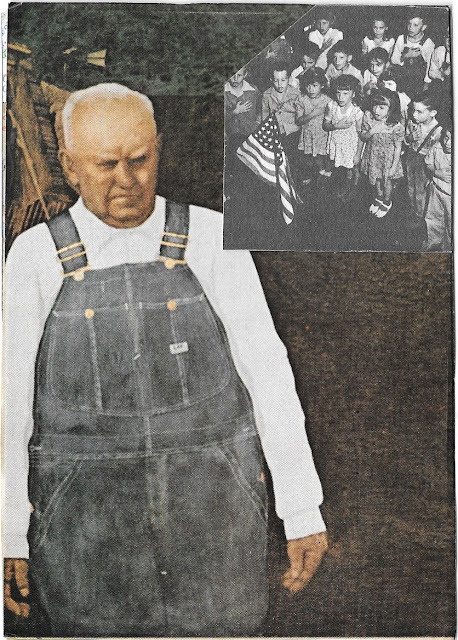 The first one was the Highland County Historical Society, located in Hillsboro, Ohio. 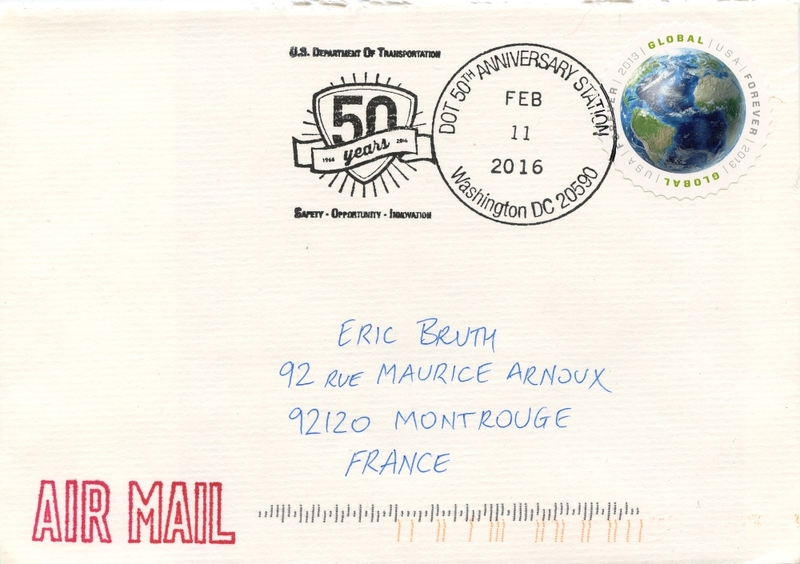 At the time I didn't notice the date was 2015, but it certainly made for a nice giant sized 50 on the envelope. 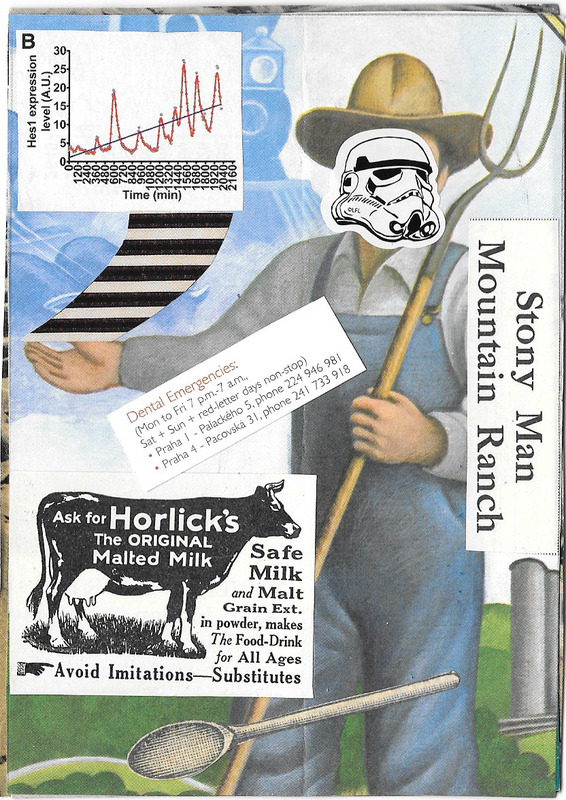 Adrienne sent me one of her classic collages. 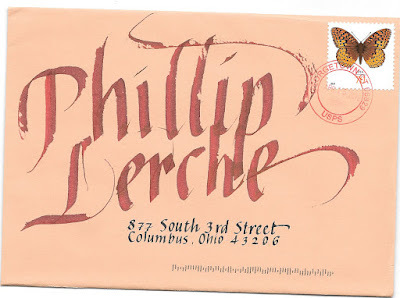 I love her style, always perfectly done. 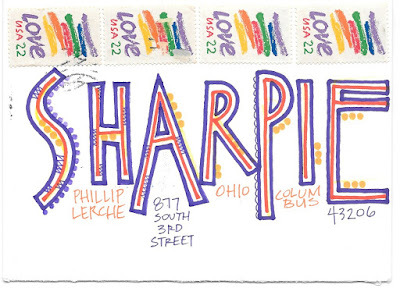 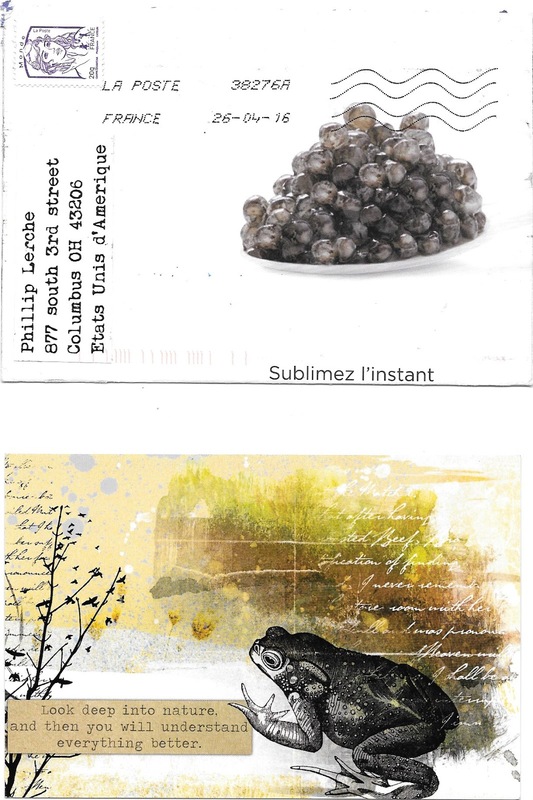 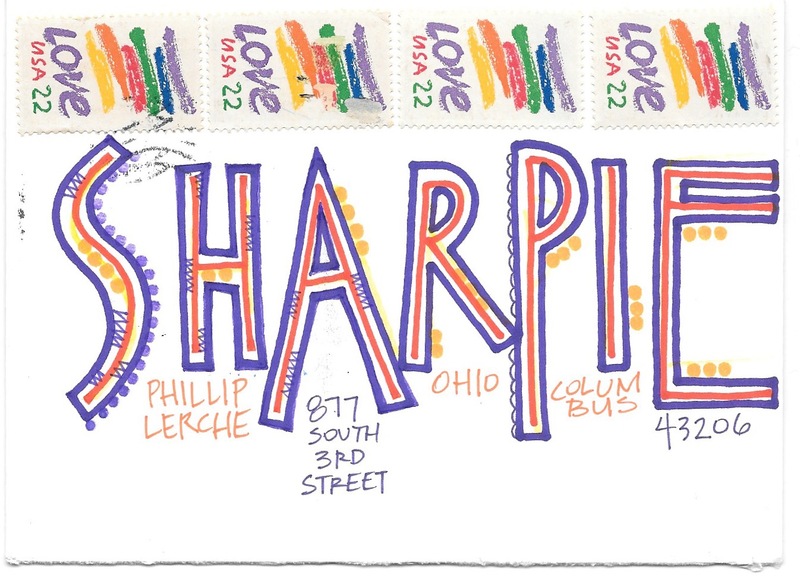 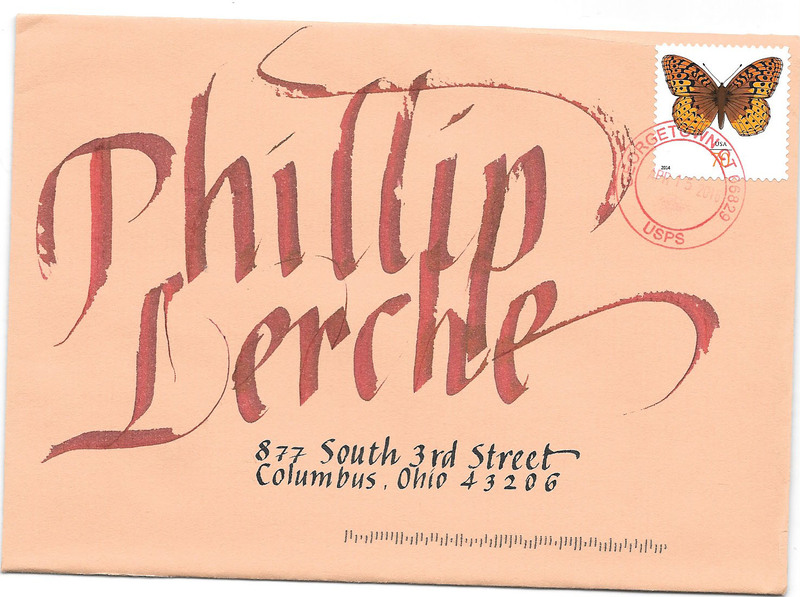 On the flip side, Adrienne loves to use interesting postage, often using vintage stamps. I hope to use the others she included in future Sunday Stamps, so they were axed for today's blog. I love the bonus collage on this side. 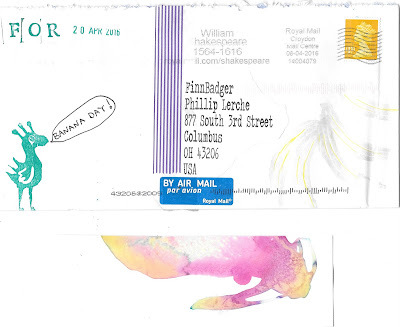 This is the first time the definitive 22c butterfly has come through the letterbox. I love the series as a whole, they are so bright and attractive. 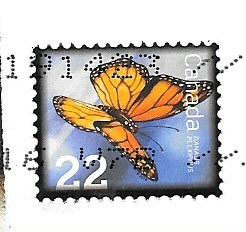 For more butterflies (and moths) on stamps, visit Sunday Stamps. More moon phases sent out to LWA, PinkyPost, Rose and Heleen - where I took some liberties in addressing her as Mevrouw ('Mrs' in Dutch) and calling her country of Netherlands 'Holland'. 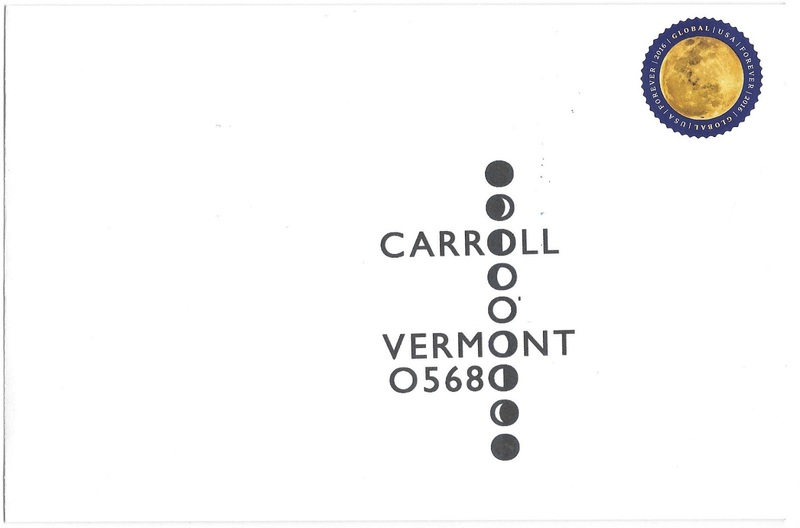 And more for Carroll, Jackie, William, Alan, Dorothea, and Adrienne. 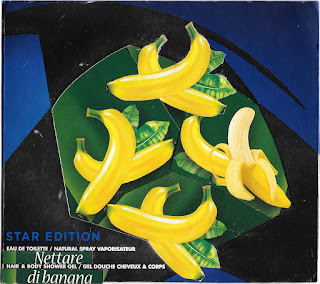 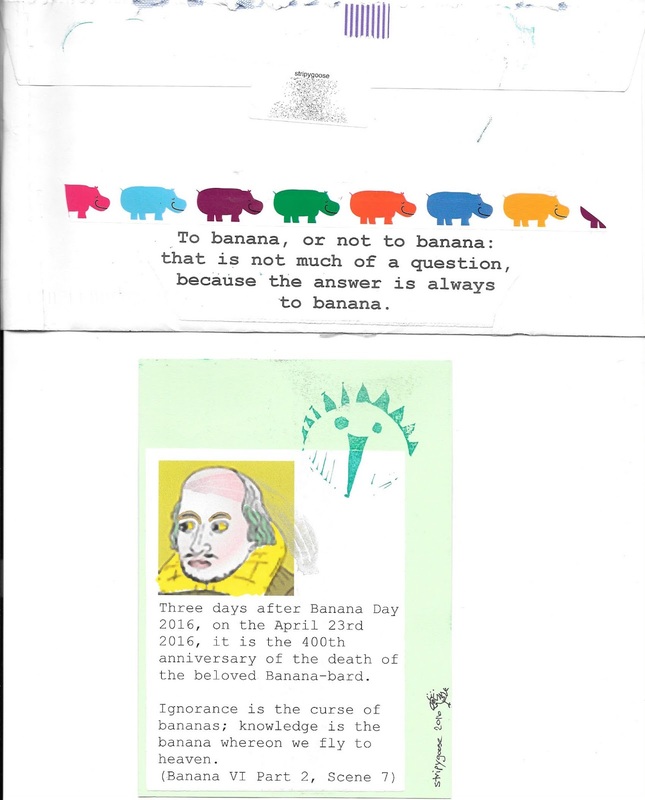 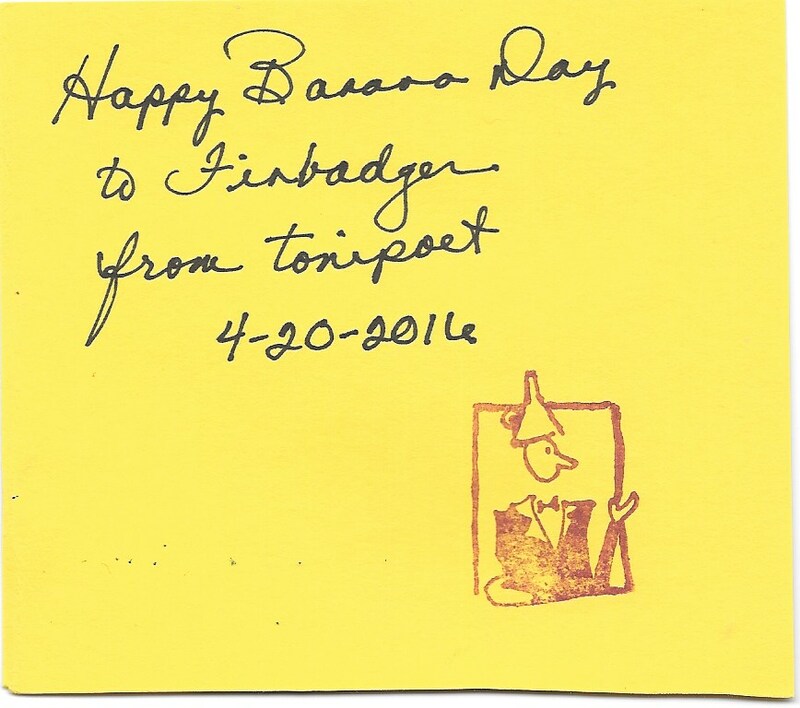 Another Banana Day occurred April 20. This is what I sent out. And this is what came in. 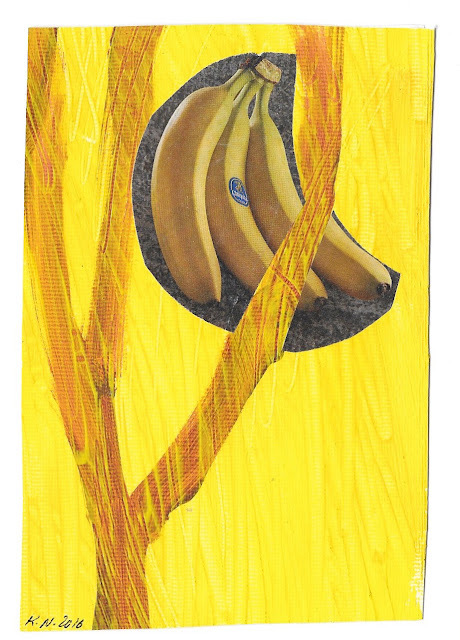 The next day, this much-delayed banana from MomKat showed up. 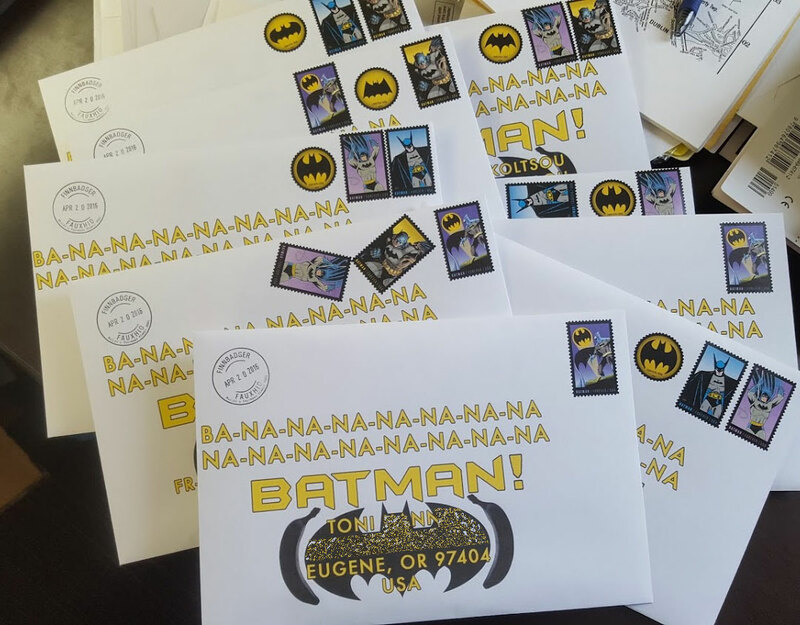 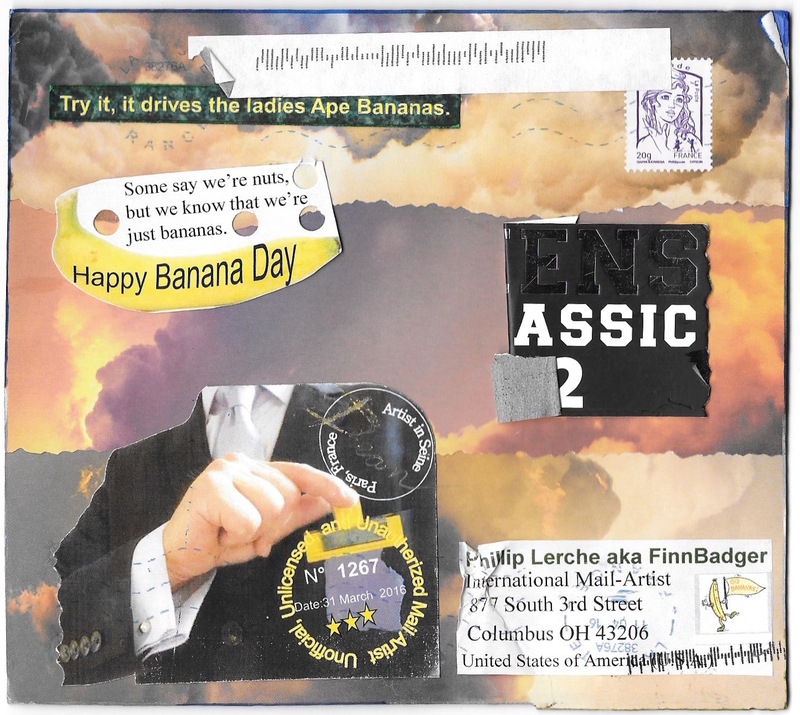 stripygoose's banana mail showed up next, forsooth! 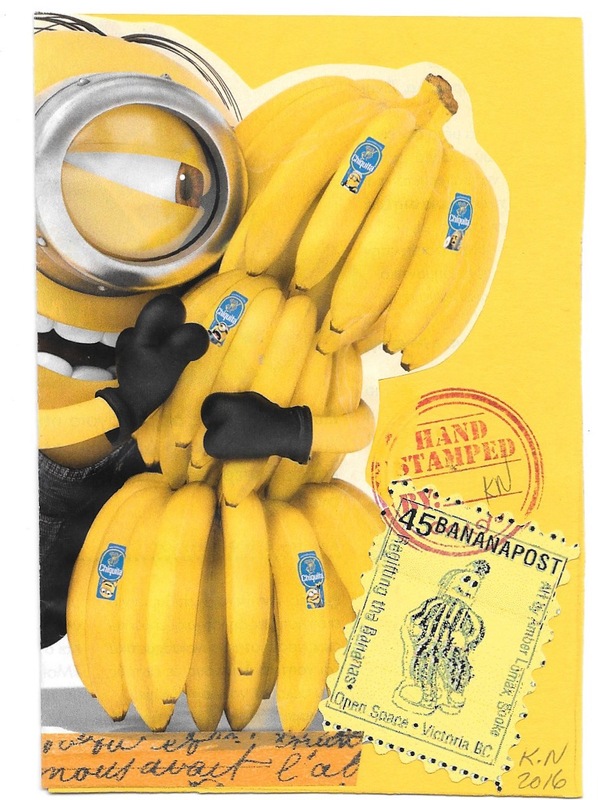 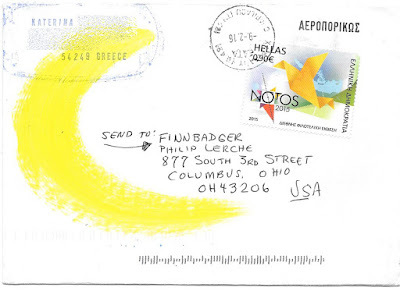 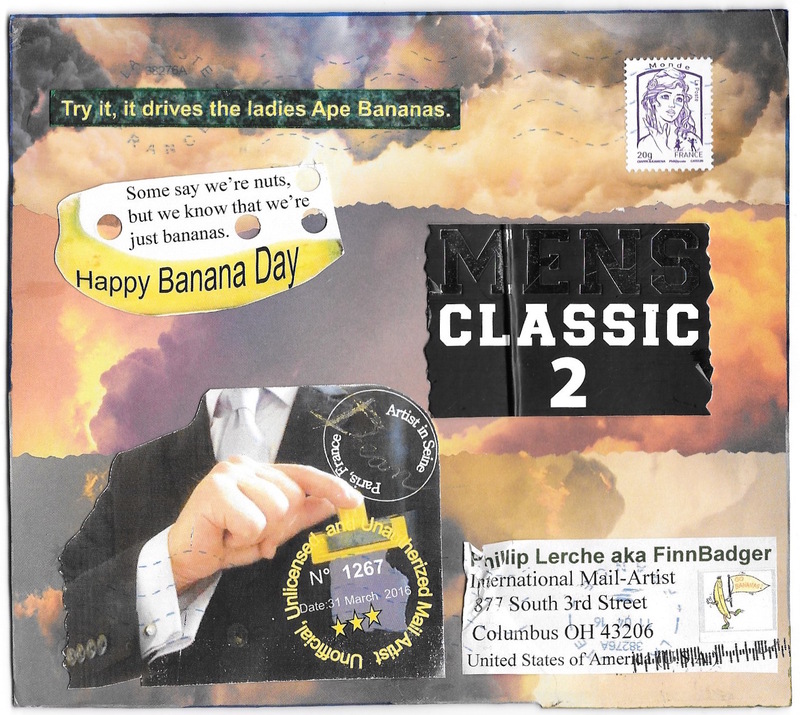 Even the stamp is banana colored. The next three arrived on the eve of banana day. From Dean, a little crumpled. 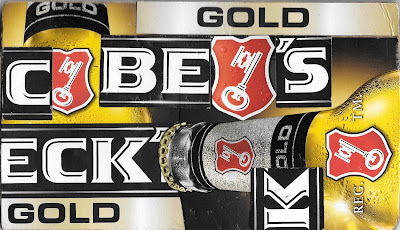 Here's the smoothed out version. 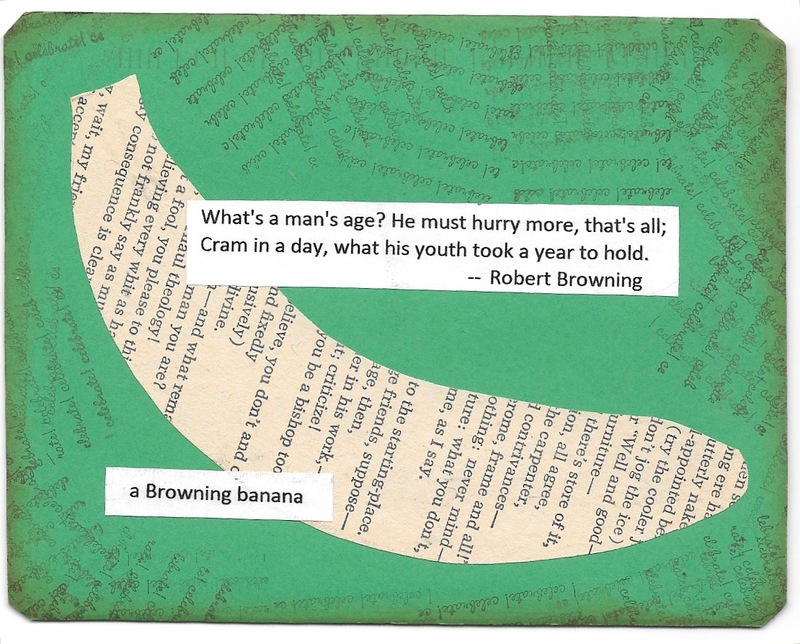 A Browning banana from Linda. 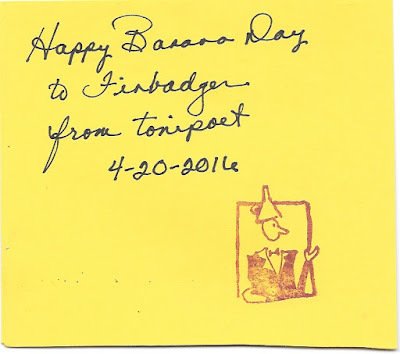 And a yellow banana from Toni. 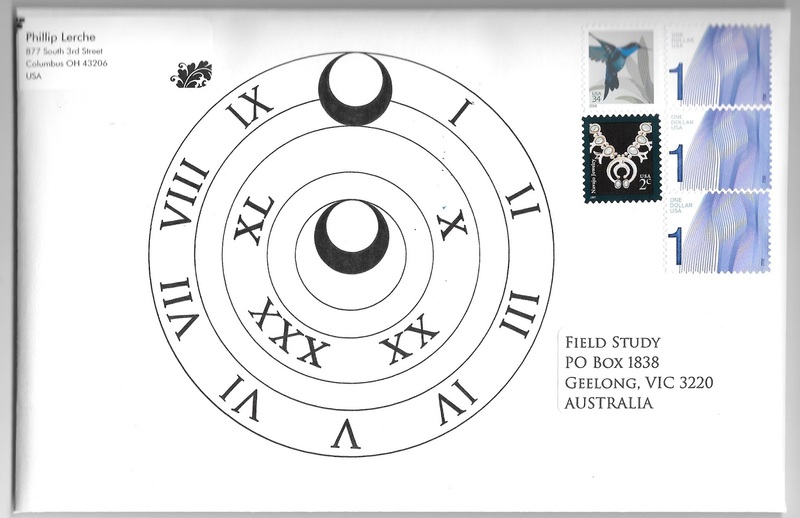 Perfect timing from TicTac, this one arrived on the big day itself with fantastic faux stamps. 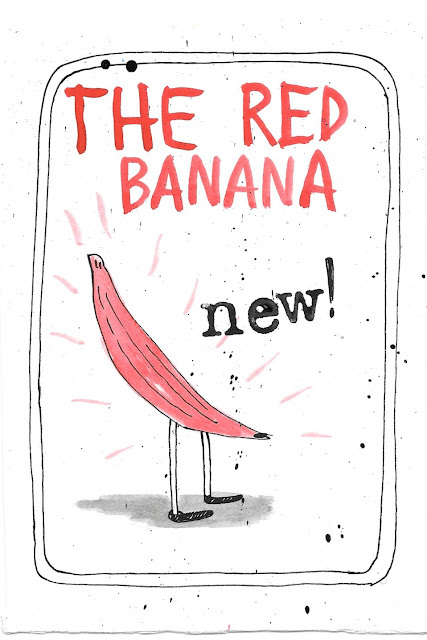 A red banana from Carina showed up a few days later. 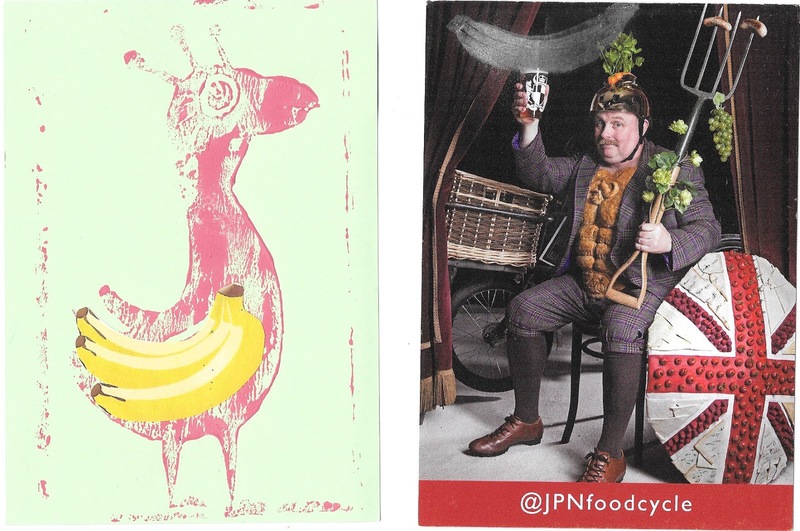 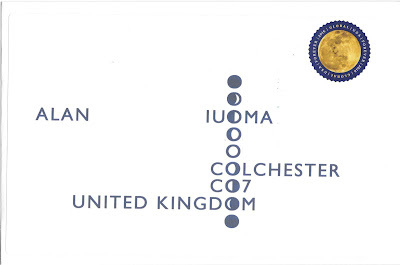 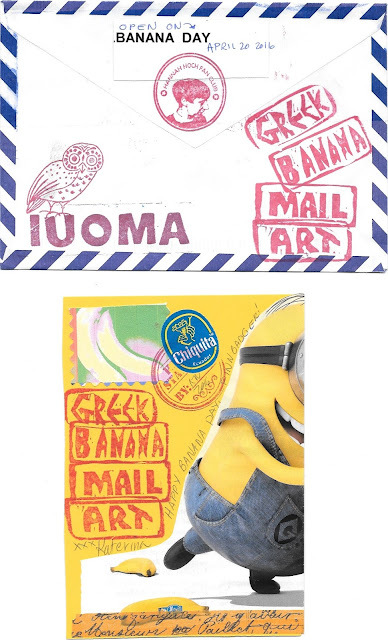 Sent in this great envelope - with fun (as always) Finnish postage. And this last one was posted on April 20 in Brazil, arriving 3 weeks later. 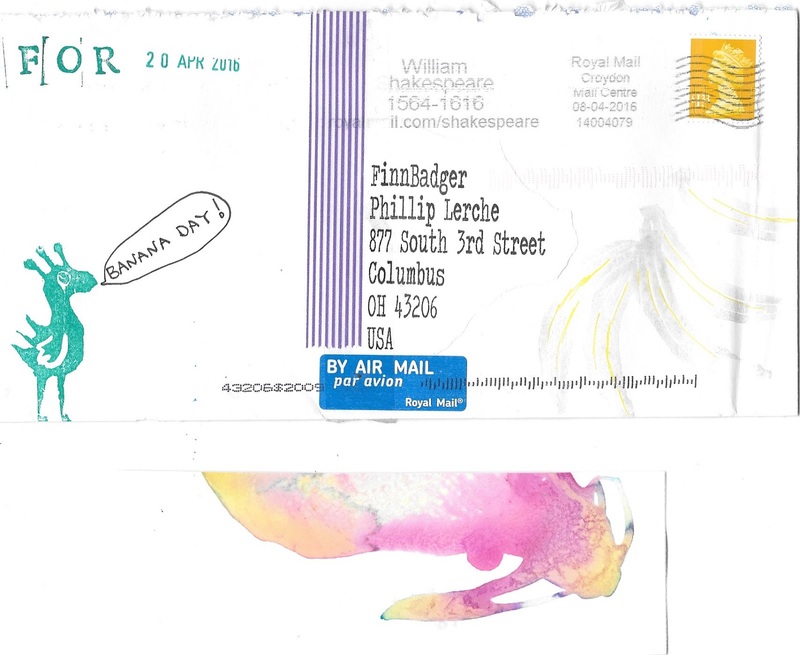 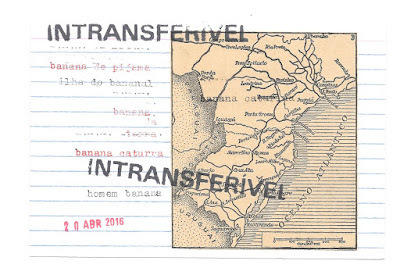 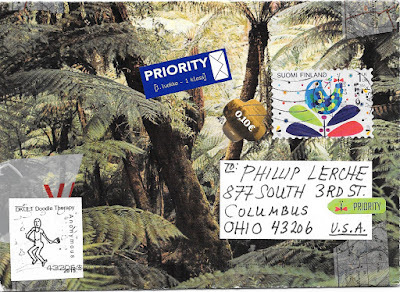 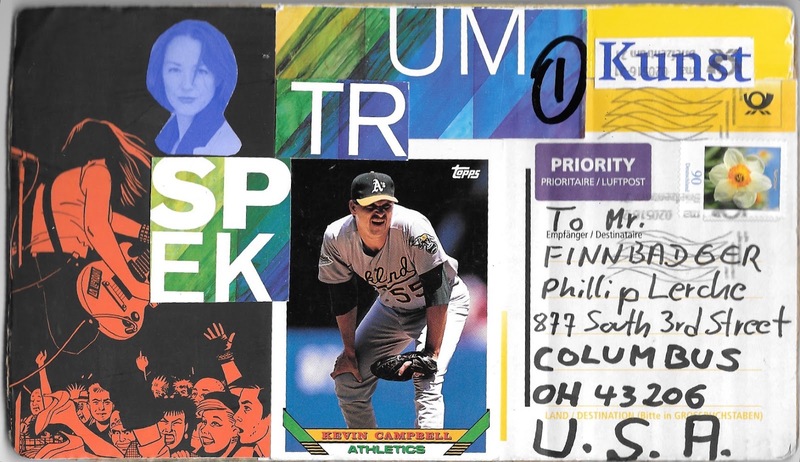 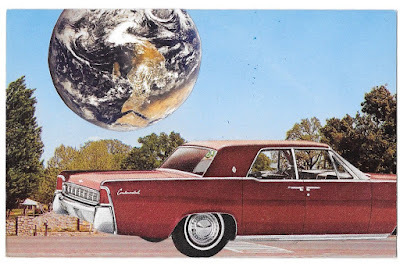 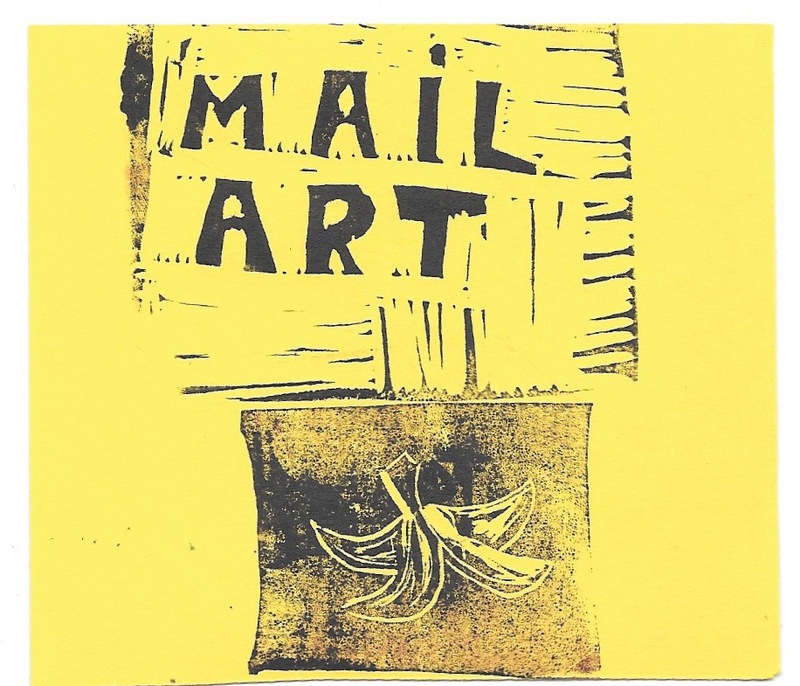 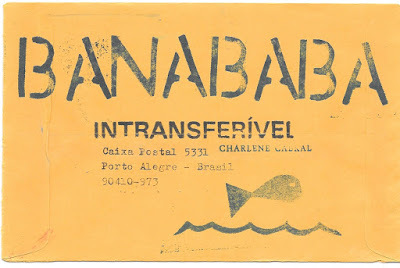 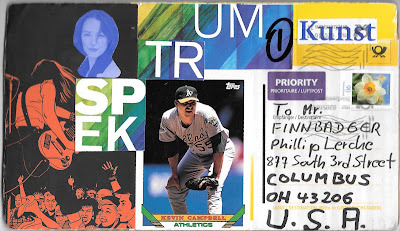 Thanks for my first Brazilian mail art, Intransferival!